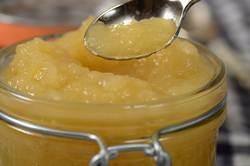 Applesauce can easily be made at home. Although we sometimes forget that, we shouldn't as homemade applesauce has such great flavor that cannot be easily found in commercial brands. All you need are some tasty apples, a saucepan, and less than an hour of your time. While we often think of applesauce as a healthy and nutritious snack for children, I like to serve it as a pudding for dessert, either with a dollop of whipped cream or a scoop of ice cream. Perfect comfort food. And don't forget that applesauce makes a nice accompaniment to pork and other meat dishes. While there aren't a lot of rules for making applesauce, one thing you absolutely need is great tasting apples. I personally like to combine two or three different types (sweet and tart), which adds a nice depth of flavor to the sauce. Some of my favorites are Jonagold, Jonathan, Honeycrisp, Braeburn, Granny Smith, Macoun, McIntosh, Fuji, Golden Delicious, Arkanas Black and Stayman Winesap. To start, core and cut the apples into small chunks. If you have a food mill you don't need to peel the apples (the peel will add flavor and color to the sauce), otherwise remove the skins. The recipe provided makes about 3 cups (720 ml) of applesauce, but you can scale this up or down. For reference, one medium apple will give you about 1/2 cup (120 ml) of applesauce. To prevent the apples from sticking to the saucepan as they cook, add enough unsweetened apple juice, cider, or water to cover the bottom of the saucpean. (Add more liquid during cooking if necessary.) Personally I like to use apple juice or cider as it adds even more "apple" flavor to the applesauce. Once the apples have become nice and soft, almost translucent, remove from heat and give the applesauce a good stir. How much you stir depends on whether you want a chunky or smooth sauce. Always taste your sauce as oftentimes you don't need to add any sugar at all. If you do, add about one tablespoon at a time and you can use either granulated white or brown sugar. At this point you can also flavor the sauce with some ground cinnamon, nutmeg, freshly grated lemon zest, Calvados or apple brandy, or even a little butter to make a smoother sauce. Applesauce is perfect for canning, or simply place in an airtight container and store it in your refrigerator for about a week or for a month in your freezer. When applesauce is stored it does have the tendency to separate, with a layer of liquid sitting on top. This is normal and simply stir it back into the solids before serving. Homemade Applesauce: Peel, core, and cut the apples into about 1/2 inch (1 cm) chunks. In a medium sized saucepan bring the apple juice, cider, or water just to a boil. Add the chunks of apple, stir, and reduce heat to a simmer. Cover and, stirring occasionally, cook (stew) the apples until soft, almost translucent (about 20-30 minutes). Remove from heat and stir, with a wooden spoon, potato masher, or fork, until desired consistency is reached (smooth or chunky). If needed, stir in 1-2 tablespoons of white or brown sugar, or to taste. Can also add a little ground cinnamon, freshly grated lemon or orange zest, a splash of lemon juice, or Calvados (apple brandy). Store covered in the refrigerator for one week or in the freezer for about a month. Makes approximately 3 cups (720 ml). Preparation time 40 minutes. *Note: I like to combine 2 - 3 different types of apples.